Excel, aka Cool and Great, is a beautiful white and dark black/brindle three-year-old female born March 18, 2003. 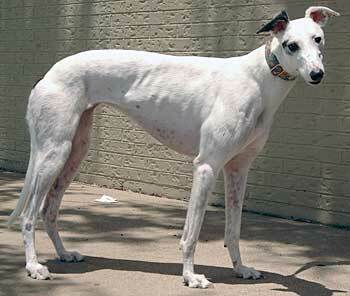 Excel, along with Whistler, came from the Corpus Christi track when the kennel that raced her closed. She is just as sweet as she is beautiful. Excel was adopted in December 2004 and has been in a home for a year and a half, where she lived with another dog. Because of her owner's failing health, she is now back in GALT's family. It is not known at this time if Excel is small animal or cat tolerant. 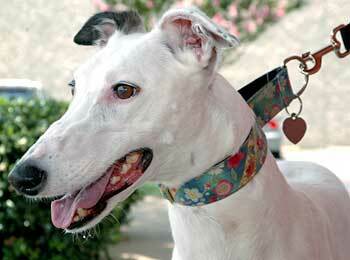 Excel received her name in honor and memory of a very special greyhound girl. 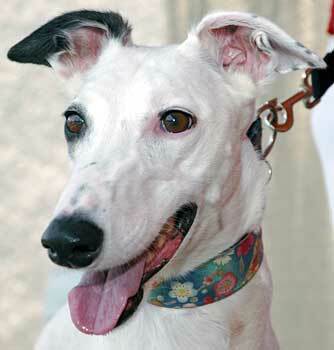 This gorgeous "blue Excel" was Kris Metz's heart dog who she lost on August 30, 2004 after a sudden illness. Kris, as a labor of love and in support of GALT's greyhounds, made wonderful fleece coats to be sold in the GreytStore. Her Excel has always been the model for these special coats made by Kris, as a donation to GALT. The fact that Kris lives in New York City makes her participation even more exceptional. So a little bit of Kris' Excel lives on in GALT's Excel.